is the leading Croatian excellence mark in green economy, awarded for services, products or technologies for highly prominent sustainability element. The Green Mark can be awarded for overall operations of the business entity or for individual brands. GREEN MARK is the result of work of Croatian experts and it is particularly important to emphasize that the greatest interest in acquiring the right to use and display the mark comes from companies whose basic activity is processing industry. This is an indicator that Croatian industrial enterprises wish to emphasize their comparative advantage – the application of the highest energy efficiency and environmental protection standards – either in the production process itself or the products and technologies placed on the market. 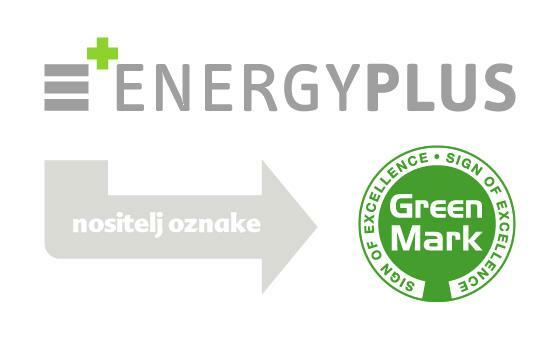 The company Foscrot Ltd, together with Energo Media Servis and the Croatian Association for Energetics wish to reach the market of the entire European Union through GREEN MARK and become leaders in the independent validation of the green economy from the aspect of services, products, technologies and business processes. For this reason, the company Foscrot Ltd from London took over the ownership of the brand GREEN MARK at the end of 2014. ENERGY PLUS d.o.o. was awarded the GREEN MARK for the period from 25 Nov 2014 to 25 Nov 2019.